Pageflakes: Get Your Custom Music Education And Technology News Fast! I thought I would share one of the web resources that I use to keep track of the many music related blogs that I follow. It’s called a pagecast and it’s from http://pageflakes.com. You can create your own if you would like by visiting their site and signing up for a free account. 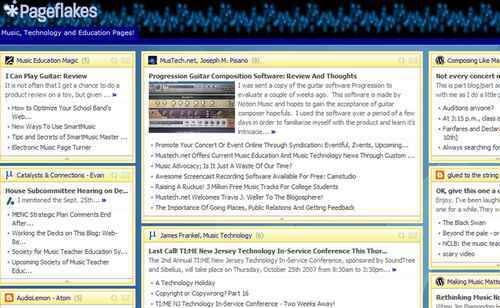 The Music, Technology and Education Pagecast is brought to you courtesy of mustech.net and has a number of great blogging and RSS resources aggregated into one web location for ease of access. I hope you like this and get some REAL use out of it. I check it everyday, it’s how I keep pace. Please let me know what you think of it.